We've all thrown “shapes” on the dancefloor, but for Simon Day and his team the word has a different meaning. When they throw Shapes, rather than some solitary arms movements and a funky wiggle, they end up with a room full of groovy mentalists at it all night. Shapes is not a dance move, it's a dance movement. Starting out at a small, intimate residents only event at language school student bar at Stokes Croft (Leftbank) in November 2011, Shapes occupied a regular residency at cultural nook Blue Mountain, before snatching In:Motion on NYD 2013, probably the most prestigious party spot on Bristol's clubbing calendar. They lived up to it too, booking Tale Of Us, Eats Everything, Todd Terje, Heidi and Richy Ahmed, proving their worth as not just the city's, but one of the UK's most formidable booking forces. Indeed, it's the love of partying that drives the Shapes ethos. An urge to reach out that little bit further, to bring something special to a city of clubbers who only expect the best, has brought the brand to Bristol's more obscure locations in recent months, including the Coroners Court last month, an eerie old school which later became a morgue, where they showcased a Junior Joop live set. 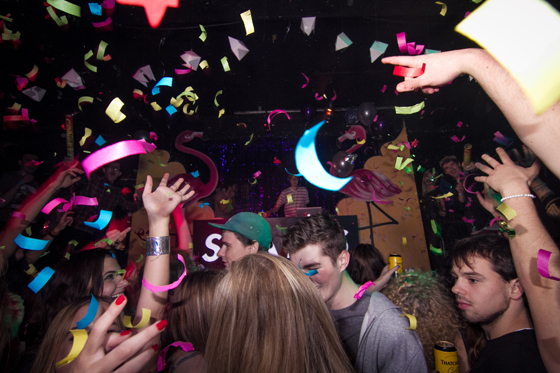 As well as a continually broadening music policy – which has seen the night branch out from its 'house, techno and all things disco' policy to attract forward-thinking live acts – it's Shapes' engagement with art and production also set the night apart, whether it's a winter wonderland theme at Christmas, light sculptures at a Masked Ball or hypnagogic video mapping. Interest from the UK-led international festival circuit has extended their even reach further, the Shapes boys finding themselves banging out tunes at the foot of an alpine ski-slope at Horizon Festival, Bulgaria, last month. Shapes will represent at Love Saves The Day and Shambarber Festival this month.